Swim cap snugly in place, Jonathan Willis is ready to glide through the water, arms and legs working in efficient unison. He moves toward the end of the pool, toward his best time, toward his ultimate goal. Willis is tall and lean with particularly long arms; it’s the body of a swimmer. There may even be a resemblance to Olympic gold medalist, Michael Phelps. Despite this, Jonathan’s path to becoming a swimmer was never a given. As a baby, Willis was highly averse to being in the water. Over time it yielded positive results. Though Willis never liked getting his face wet, he decided joining the Special Olympics swim team sounded like a good idea when he was 10 years old. Jonathan started with the assisted swim, competing with a partner, and he took third in Summer Games that year! The year after, he came in first. From that point on Jonathan was a swimmer. The next year, Jonathan decided to try a new event, the 25-meter race, unassisted. And as it turns out, Willis only has one speed–go! “He doesn’t want to pace himself, he just wants to win!” his mom observed. Now in his fifth year with Special Olympics, Willis decided to move into the 50-meter swim. Once again in his first year in an event, he landed a silver medal at the 2017 SONC Summer Games. Though, he quickly adds that wearing his medals to school gives him something to talk to girls about! Even with all his successes to date, Jonathan’s ultimate goal looms large. He has been invited to the Special Olympics World Games in Abu Dhabi. 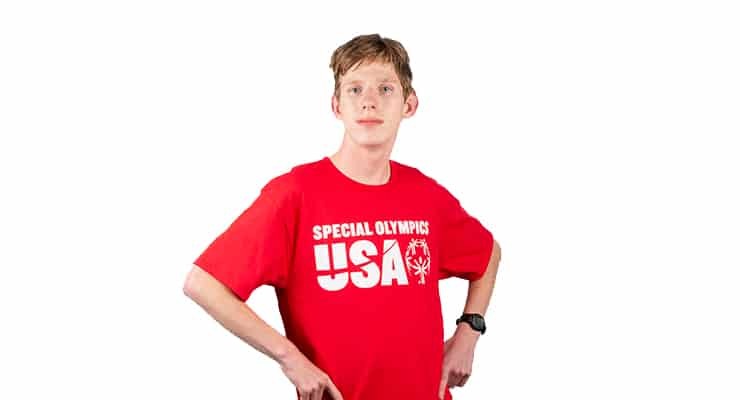 At just sixteen years old he will travel with Special Olympics USA and compete against athletes from all around the world for the top honor-a gold medal. It is sure to be a life changing event, and Jonathan has lots to do to prepare. He has increased his training schedule and is working on picking up a new swim event, like backstroke. “We’re working hard at it until March,” says mom, Brenda. With the new event Jonathan has to confront his old aversions to getting his face wet and work through mobility restrictions in his shoulder due to cerebral palsy. “To tell you the truth, I really don’t have any problems,” says the relentlessly positive Jonathan. Which means, to Willis, just say go and conquer your fears. So, it’s just about how he approaches his life. He’s just going to go out and do it. He’s just going to go out and be lit up. Authorized and Accredited by Special Olympics, Inc. for the Benefit of Persons with Intellectual Disabilities.